For many transfer students, living on campus is an important part of the university experience. As a transfer student, you can participate in programs at your UCSC college and at your housing community. The Transfer Community is located at Porter College and situated on campus to provide easy access to Services for Transfer and Re-Entry Students (STARS) and the Academic Resources Center (ARC). This is the primary housing option for incoming transfer students (regardless of college affiliation). Incoming transfer students affiliated with any UCSC college are welcome here. 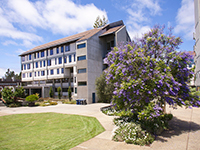 Transfer Community students will benefit from an academically and socially supportive environment offering special programs designed to help them transition to campus life, build a strong connection with the campus, and get the most out of their UCSC experience. The Transfer Community is a residence hall facility with single, double, and triple rooms. 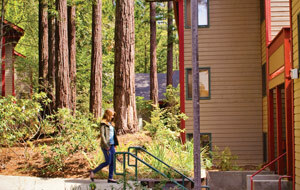 Redwood Grove is a small, quiet community for incoming transfer students (regardless of college affiliation). Students must be 23 or older. There are 28 apartments, most of which are five-person apartments consisting of three singles and one small double. Read more about Redwood Grove apartments. A limited number of spaces for transfer students are also available at the University Town Center. 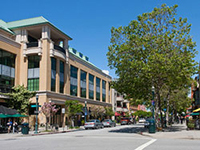 University Town Center (UTC), is located in downtown Santa Cruz (1101 Pacific Avenue) and only minutes from the Transit Center with direct bus access to campus. The UTC has double and triple rooms with private bathrooms and kitchenettes.